This is the moment traffic cops catch up with a banned driver who raced through the streets of Sunderland with no front tyre. Dylan Robinson has this week started an eight month jail term and will serve a two-year road ban as a result of his Christmas Day decision to get behind the wheel. Robinson's car comes to a stop after striking a curb in Penn Square on the Ford Estate. Newcastle Crown Court heard the 25-year-old, of Ashkirk, Gilley Law, was left with no front tyre after repeatedly hitting a curb at speed but still refused to stop for police during the eight-and-a-half minute chase on the early evening of December 25 last year. 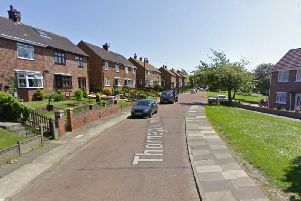 Footage now released of Northumbria Police's efforts to bring his car to a halt show it being trailed around housing estates, before turning off Fordfield Road into Penn Square, where the vehicle comes to a halt and officers block Robinson's door. After the case, Pc Gary Morris, of Northumbria Police’s motor patrols unit, said: "This was an incredibly dangerous incident which saw a disqualified driver try to evade police by tearing around the streets of Sunderland at high speeds. "This all unfolded on the early evening of Christmas Day, at a time when children could easily have been playing with toys they had opened that morning outside. "Dylan Robinson endangered the lives of residents and police by his selfish actions, and showed a total disregard for the law. His sole intention that night was to make sure he was not caught due to the repercussions he would inevitably face. "There is absolutely no excuse for that manner of driving on our region’s roads, and clearly Robinson is not responsible enough to get behind the wheel." Prosecutor Jessica Slaughter told the court officers saw children playing on bikes and families walking along streets as they travelled through housing estates in pursuit of Robinson, but he continued to drive through 30mph and 40mph zones with no front wheel. Robinson, who has a partner and child, admitted dangerous driving, driving while disqualified and having no insurance. Passing sentence, Mr Recorder Paul Reid said: "The trouble is, children playing with Christmas presents and the like, would expect it to be quiet. He said Robinson had decided to give friends a lift home from his house after they visited on Christmas day. He added Robinson had got the car with the intention of getting back on the roads legally but added "temptation was just too much".